June 15, 2015 (San Diego’s East County) – Helix Water District’s Board of Directors will vote on whether or not to close the campground at Lake Jennings in Lakeside. The vote is set for Wednesday, June 17th at 2 p.m. at the board meeting at the district’s headquarters, 7811 University Avenue in La Mesa. The vote is slated despite huge gains made in stemming financial losses, from $200,000 in 2013 to just $24,000 this year, plus increased profitability of other attractions and activities with potential for more, including state approval to add kayaks just last month. June 9, 2015 (San Diego’s East County) – If you live in the cities of El Cajon, La Mesa or Lemon Grove, your fire insurance rates will soon be going down. That’s because Heartland Fire & Rescue, which provides firefighting services for all three cities, has received a class 1 rating from the Insurance Services Office (ISO). The ISO rates 47,000 fire departments across the United States and of those, only 98 have attained a class 1 rating, including only 8 fire districts in the entire state of California. “Class 1 communities are very rare, and some of these scores are the highest we’ve ever seen,” says Stephanie Ruscansky from the ISO, who notes that only a small fraction of 1% of all agencies rated attain a Class 1 rating. June 7, 2015 (San Diego’s East County) – Artist Chuck McPherson has picked up six awards at the San Diego County Fair at Del Mar, after having a record nine entries accepted. The talented artist grew up in Spring Valley, lives in La Mesa and regularly dazzles crowds with his innovative performance art and colorful style at local charity events (he’s been known to add lipstick, coffee grounds and other audience-provided items to his works). June 2, 2015 (La Mesa)--The San Diego Concert Band is proud to be a part of the 14th season of the City of La Mesa’s “Sundays at Six” free outdoor concerts. The Band has played every year and this year is slated to perform on June 14th from 6 to 7 p.m.
May 29, 2015 (La Mesa) –A Craft Beer and Wine Summer Festival to benefit the La Mesa Historical Society will be held on Saturday, June 6 from 1 to 6 p.m. at 4888 Date Avenue at the La Mesa Farmer’s Market parking lot. The festivities include unlimited tastes from 20 breweries plus a VIP lounge, live music, food trucks, and over 30 vendors. May 21, 2015 (La Mesa)- At yesterday’s meeting, the La Mesa Planning Commission voted to deny approval of a revised Park Station plan because of its inconsistency with the general plan and community objectives. The vote was 4-2 with Commissioner Dexter Levy absent. Next up, the City Council will be asked to decide Park Station’s fate. May 18, 2015 (La Mesa)--Whenever, he sees his Sherpa carrier, Marcel gets all excited. This doggie loves to travel which is good since his owner, Maggie Espinosa, happens to be a travel writer! They have gone to various parts of the United States, Mexico and France. They live in La Mesa, CA where Espinosa’s husband works as a veterinarian in his own clinic. May 15, 2015 (La Mesa)--Want to learn more about wine but not sure where to start? @Spacebar Café & Wine Bistro invites you to a wine class, tasting and pairing on June 3rd from 6:30 to 9:30 p.m.
May 10, 2015 (La Mesa) - The Grossmont Healthcare District’s Dr. William C. Herrick Community Health Care Library, 9001 Wakarusa St. in La Mesa, will host a free program on “De-Clutter and Downsize for Happiness and Health,” from 10 to 11 a.m. on Wednesday, May 27. The program is part of the Grossmont Healthcare District library’s “Wellness Wednesday” series, normally held on the fourth Wednesday of the month. The craft beer scene in San Diego is taking the nation by storm, and Craft Kitchen Restaurant in La Mesa is the latest addition to the burgeoning industry. May 8, 2015 (La Mesa)--The 7th Annual Golden Artistry Jewelry Design Competition was honored with a special fundraising event at the La Mesa Women’s Club on Friday evening, May 1st, 2015. Terry Whyte, owner of Golden Artistry in La Mesa Village, established the competition to encourage and inspire young designers from the high schools of the Grossmont Union High School District. May 5, 2015 (La Mesa) – On April 28 the La Mesa City Council voted unanimously to allow telecommunications equipment to be installed on streetlights and signals in the right-of-way in 11 locations around the City (map below), to enhance cellular phone and data transmission coverage. The company will pay the City as a Right-of-Way Use Fee of 5% of adjusted gross revenues generated from the equipment or $500 per location, whichever is greater, and an annual fee of $500 to attach its equipment to a City pole. It will be required to apply for an encroachment permit, and will bear the costs of installation and maintenance. May 4, 2015 (La Mesa) -- Myra Witzer, a strong willed woman in her late thirties, is determined to get married at any cost and Leonard Shank, an unassuming man in his early forties, is the guy she goes after and gets, much against his will. After several months of married life, Myra realizes that the chase excited her more than the capture and wants out. On the other hand, Leonard, who at the beginning wanted no part of the marriage, now wants to stay married to her more than anything. Now that he's fallen for her, will Leonard be able to convince her that he's her prince charming? Upated May 1 to add comments from Mike Bullock and data from a climate change paper he authored. April 30, 2015 (La Mesa) – At La Mesa’s City Council hearing Tuesday, Council heard a report detailing the city’s progress on reducing its carbon footprint in order to reduce climate change. April 29, 2015 (La Mesa) -- The City of La Mesa has once again updated its economic development webpage with refreshed Commercial Space Availability Reports. According to the most recent reports, dated April 2015, there is approximately 146,000 square feet of retail space available in the City; 150,000 square feet of office space; and 37,000 square feet of industrial space. Retail vacancy is down over 20% from April 2014 and office vacancy is down roughly 14%. Note: The event has been relocated to the Vons Shopping Center, 8011 University Ave., from 9:00 am to 1200 pm. The article below has been changed to reflect that. April 29, 2015 (La Mesa) -- The City of Mesa has declared May “Drowning Prevention Month”. To help kick off the month, Heartland Fire & Rescue has teamed up with the La Mesa Municipal Pool for a drowning prevention event on Friday, May 1st. April 27, 2015 (La Mesa) – Back in December 2013, the city of La Mesa installed roundabouts to slow down speeders at two locations on Harbison Avenue, at the Watson Way and Annapolis Avenue junctions. April 27, 2015 (La Mesa) -- It’s a beautiful, sunny day in Southern California as patrons enjoy lunch and dinner at Himalayan Cuisine, and shopping at the Himalayan Bazaar in La Mesa. But on the other side of the world in Nepal and in parts of India and China, the scene is much different: it’s raining, it’s dark, and it’s destroyed. Mr. Khem Kharel, owner of Himalayan Cuisine in La Mesa and a native of Nepal, says that his immediate family in Kathmandu--his 84 year old mother, his brother, brother’s wife and other family members--are thankfully “fine, just scared” and hungry. He has been in touch with his family, briefly, by phone, two times since the epicenter of the massive 7.8 magnitude earthquake struck the remote village of Barpak, in the northern-central Gorkha District, about 50 miles northwest from Nepal’s capital, Kathmandu on April 25. The latest numbers report more than 4,400 deaths. 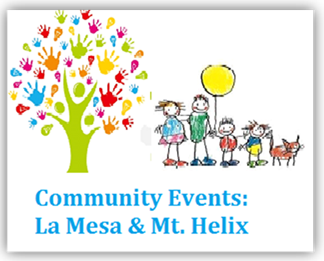 April 27, 2015 (La Mesa) -- The City of La Mesa is offering a Child and Babysitter Safety Class on Saturday, May 16, from 9:30 am – 2:00 pm at La Mesa Community Services. This is a fun hands-on community education program for youth ages 11 – 16 that covers child safety and basic care for infants and children. April 27, 2015 (La Mesa) -- Do you have a budding artist or a child that loves to learn Chess? What about your sports enthusiast or do they love to work with wood and tools? La Mesa Community Services is offering twenty-one (21) “Summer to Remember!” camps that will put a smile on any child’s face ages four years and up: Archery, Art Smarts, Baseball, Basketball, Chess, Code to the Future, Dance, Day Camp, Engineering, Fencing, Flag Football, Golf, Gymnastic, Jump Rope, Kids in the Kitchen Cooking, Mad Science, Martial Arts, Multi-Sport, Tennis, Woodworking, and Yoga Rascals.